Ira Sachs’ last film, the delectably bittersweet Love Is Strange, focused on the enduring love between two men: one middle-aged, the other late in life. Yet it ended with a gesture that kick-started a teenager’s passage from petulant kid to considerate young man, as Sachs passed the baton from one generation to another with quiet optimism. 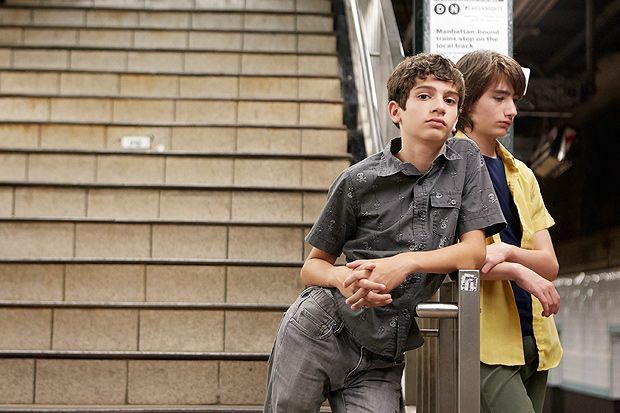 Little Men picks up where that film left off, at least thematically, with coming-of-age now the primary focus. Featuring the great Paulina García (Gloria) in a rare English-speaking role, it’s the story of 13-year-old Jake Jardine (Theo Taplitz), an aspiring artist who moves to Brooklyn with his parents (Greg Kinnear and Jennifer Ehle) when his grandfather passes away. Along with a spacious apartment, the Jardines have inherited a retail premises currently occupied by Leonor (García). She runs a struggling dressmaking store, her business – up until now – sustained by the old man’s generosity. As the adults bicker over a proposed hike in Leonor’s rent, her son Tony (Michael Barbieri) and Jake become firm friends. Coming-of-agers are ten-a-penny and the New York setting too has been done to death, but the film’s perspective feels distinct. It forgoes clichés and the obvious emotional angles to fruitfully explore the frustrations of ‘kidulthood’ – in particular, the boys’ futile attempts to affect change in the increasingly fractious communications between their families, as well as the societal pressure to grow up quickly. We see the strain they are under to forge their life-path early, and to emulate adult swagger, beautifully illustrated as they attempt to dance their cares away at a junior club night. The central tenancy dispute is engaging too, for what it says about changing neighbourhoods, class and intergenerational relations, and because it’s presented in a way that’s finely balanced, with neither side behaving perfectly (Leonor’s predicament may be sympathetic but her jibes are a masterclass in cruelty). Little Men has a lightness of touch which belies its formidable powers of observation; frequently insightful and superbly performed, it presents us with a rainbow of recognisable humanity. Screening on Wed 22 and Thu 23 Jun as part of the Edinburgh International Film Festival 2016. General release TBC.